It certainly wasn't like in the movies, where a horde of "Redskins" ride out of the timber, giving a high-pitched, quavering yell, as they circle an unsuspecting wagon train and rain arrows on the "white eyes." 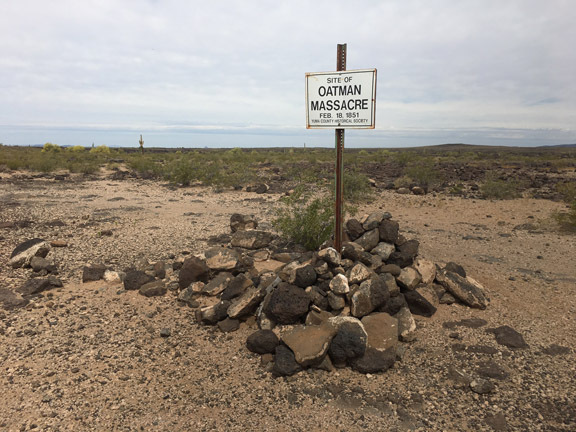 The deadly attack on the Oatmans on February 18, 1851 by a Yavapai hunting party (Olive put their number at 17) was almost the exact opposite of the Western movie staple most of us grew up on. And in some ways, it makes it even more chilling and unnerving. Royce (also styled as Roys) Oatman and his family (seven kids and a very pregnant wife) had just finished hauling their belongings up a rocky grade to a bluff on the south side of the Gila River. "leisurely approaching us in the road." It was the end of a long day and their oxen were bone tired and so was the family. Oatman's wife, Mary Ann, 38, had enough strength to prepare a pot of bean soup and some bread for the family to eat before they continued on—they intended to travel all night to avoid the heat of the day. They were 120 miles from their destination. Lorenzo, 14, was loading the last of the baggage back in the wagon, when he turned and saw "several Indians slowly and leisurely approaching us in the road." Royce had a rifle but it was in the wagon. The Indians asked for tobacco and pipe, which Royce promptly produced. After the warriors finished smoking one of them mentioned seeing "two horses down in the brush." (this is intriguing because an American traveler, further down the trail towards the Colorado River, later reported having his two horses stolen the day before). 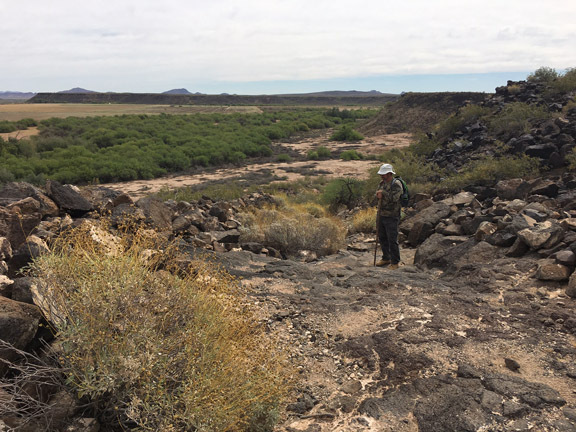 According to the author Brian McGinty, "The Oatman Massacre," the winter of 1850-51 was the driest on record in the Southwest, so it's not hard to imagine the Yavapais being part of a hunting, or foraging party, seeking game or bounty to take back to their starving kin. This doesn't excuse what they did, but it gives some needed context to their actions. The Yavapais asked for pinole (corn meal) but Royce protested that he didn't have enough to give away, but they persisted and Royce reluctantly gave them some bread, which they ate, then asked for more. When Royce said no, he didn't have any more, one of the Indians brazenly walked over to the wagon and climbed in the back, rummaging around inside. When he came out, he demanded meat. When Royce again protested, the Indians became bolder and started taking objects from the wagon and stuffing items in their clothing. When the family again protested, the Yavapais withdrew a few paces and began talking in their native tongue. Essentially, they were divvying up who would kill who, and, who to spare. A pile of rocks and a plaque mark the spot where the massacre happened. It is known today as Oatman Flat. Royce tried to keep calm and started reloading the wagon with the family belongings the Indians had strewn about on the ground. At this point, one of the Yavapais let out a "deafening yell" as each warrior attacked a member of the family with a war club. Royce, his wife, his daughters Lucy and Charity Ann and his sons Roys, Jr. and Roland were brained senseless, falling to the ground. Lorenzo was also bashed on the head, and with blood streaming down his face, he half-ran, half-stumbled towards the edge of the bluff and fell over the side. Only two were spared, Olivia, 13, and Mary Ann, 8, who were forced to watch the warriors strip the dead bodies, looking for items of value. The raiders broke open boxes, tore open a feather bed, scattering its feathers to the wind. They took the wheels off the wagon, tore the canvas canopy off its frame. They unhooked the oxen, bundled up their plunder and rudely pushed the girls in front of them, as they headed back down the bluff into the gathering darkness. "After we had descended the hill and crossed the river, and traveled about one half of a mile by a dim trail leading through a dark, rough, and narrow defile in the hills, we came to any open place where there had been an Indian camp before, and halted. The Indians took off their packs, struck a fire, and began in their own way to make preparations for a meal. They boiled some of the beans just from our wagon, mixed some flour with water, and baked it in the ashes. They offered us some food, but in the most insulting and taunting manner, continually making merry over every indication of grief in us, and with which our hearts were ready to break. We could not eat. After the meal, and about an hour's rest, they began to repack and make preparations to proceed." How was Lorenzo able to tell about what the Indians said if he was one of the slaughtered member of the family? Ah, good eye, Mr. Unknown. I'll do Lorenzo's story tomorrow. He wasn't slaughtered he was left for dead. He went on to search for his sisters. Maryanne died, but olive was returned to him by the Mojave tribe in exchange for some blankets I believe. One of those brained with a war club survived and I'll do his story tomorrow. Thank you for this post, Mr. Bell. I always wondered about the Oatman Massacre, but never found a book that contained information about it. Olive must've been an exceptional young woman to survive all that. I have seen pictures of her, and wondered at the strength of character that she and her future husband displayed when he married her despite all the prejudice of the time. Must've been a true love match. My name is Doug Martin, but the reply button won't let me reply that way. I'm assuming this Olive Oatman is the same one that the Eva character on Hell on Wheels is modeled offered. I highly recomend it, very jnteresting.